Read the full review on Ceations Magazine. Jennifer Brannon-Hawkins writes pure love in this book and essentially takes you on an emotional ride through her journey of finding her husband’s lifeless body one morning and then her courageous quest to be the sole provider and protector of her boys from that day forward. Read the full review on Amazon. I loved this book, even though I cried like a baby through the first half of it. It broke my heart that Jennifer and her boys lost Mark so suddenly. Like a previous reviewer, I struggle with the fear of losing a loved one. The experiences that Jennifer shared were stunning, inspiring and comforting. After my tears dried, I found myself looking forward to each chapter and seeing how their lives were unfolding and healing. Read the full review on Good Reads. This is the true/RAW story of an amazing woman, her 2 young boys and their recovery after the loss of her husband…. 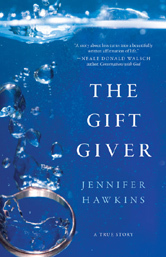 The Gift Giver: A True Story by Jennifer Hawkins is very well written, and the story just flows. I, the reader, felt like I knew these people. I wanted to be there for them, hug them, and see them get through this hardship. I thought it was very inspirational. In the end, it shows that through even the worst of circumstances – there will always be hope. Hope that even the “bad things” that happen have reason. Hope that those we care about know how much we love them. Hope that the things we do (and don’t do)…matter. I thought this was an excellent read, but be warned…you WILL need kleenex.